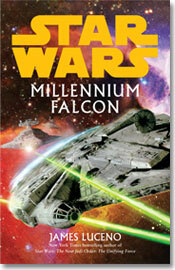 Star Wars: Millennium Falcon is an exciting, action-packed adventure that begins shortly after the events of the New York Times bestselling Legacy of the Force series. A secret is uncovered on the Millennium Falcon that dates back to the years before Han won the ship from Lando Calrissian in a game of Sabaac. In an effort to unravel the mystery, Han, Leia, and their young granddaughter, Allan, follow the clues of the Millennium Falcon's history back to its very construction -- and discover an elaborate plot to overthrow the Emperor. The excitement of Star Wars never ends.